Now the time has come and the next chapter in the Samsung Galaxy Note story has arrived. The market leader in smartphones isn't daring to take any optical risks, but is now equipping the Galaxy Note 9 with a new S-Pen, a larger battery and finally the fingerprint sensor is in the right position. And what else? Find out in our review of the Samsung Galaxy Note 9! 100 days with the Galaxy S9: Samsung, you’re better than this! In this day and age, it’s no surprise when a smartphone with the features of a Samsung Galaxy Note 9 exceeded the 1,000 dollar barrier at launch. The device’s predecessor, the Galaxy Note 8, already scratched at this limit. For the basic version of the Note 9 with 6 GB of RAM and 128 GB of internal memory, Samsung was charging $1,000, and the version with 8 GB of RAM and 512 GB of memory used to cost you $1,250. Now, as 2018 draws to a close, the price has dropped significantly. At the time of writing, you can buy the 128 GB version for just $708. That brings the Note 9 down to a more than reasonable price for the overall package. Samsung’s design team didn’t have to recreate much on the 6.4-inch phablet, and it's much more focused on improving the details. The huge high-resolution Infinity display dominates the front of the panel , and on the back Samsung has finally moved the fingerprint sensor to a more convenient position. The back stands out a little more in comparison to the previous model thanks to the repositioning of the fingerprint reader. It's now easier to reach, but as is the case with previous models, it does not stand out for its speed. Compared to the Note 8, the Galaxy Note 9 is slightly shorter and slightly wider and thicker, but the difference is minimal. Samsung has succeeded in introducing a larger screen and a larger battery capacity. And as a result, the device is a bit heavier. Due to its size, it is virtually impossible to use with one hand. The Note series has always been a representative for the world of phablets and this is nothing new. Interestingly, Samsung has added a touch of originality to the S-Pen by introducing new colors. The Ocean Blue coloring with the yellow S-Pen is truly unique and aesthetically pleasing. With a 6.4-inch display, the Galaxy Note 9 is 0.1 inches larger than its predecessor. In terms of visualization technology, Samsung is known and acclaimed for its SuperAMOLED panels characterized by absolute contrasts, brilliant and accurate colors as well as unparalleled brightness. The S-Pen has always been the distinctive feature of the Note series. The Note 9 is no exception and is coming to the market with a stylus. Equipped with the Bluetooth 5.0, the S-Pen incorporates new useful features . You can use the button as a remote control for photos. Samsung has opened the API for S-Pen functions so that app developers can integrate the stylus functions in their app programming. The S-Pen is designed for about 200 minutes of autonomy, and it takes just 40 seconds of charging to get 30 minutes of use. To charge the S-Pen, just insert it in the dedicated slot at the bottom of the device. The Bixby button is located on the left side and can no longer be deactivated. Get ready to crash into the Bixby interface every time you unlock your smartphone after pulling it out of your pocket, just like on the previous Galaxy models. Bixby is still Bixby: don't expect much more. One of the more appreciated novelties, especially for professional people who want to carry their workplace in their pocket, is the option of using DeX without any special accessories. All you have to do is connect the Note 9 to a display using a USB Type-C / HDMI cable and you can start using desktop mode. You can connect your mouse and keyboard via Bluetooth or use the Note screen as a trackpad and keyboard. The rest remains unchanged from what we have already seen from Samsung thanks to the DeX pad Galaxy S9. The Note 9 comes with Android 9.0 and has the One UI version of Samsung Experience. The Samsung interface has improved in recent years, and the new software has been a breath of fresh air. The Note 9 is reactive and snappy like no Galaxy before it. Samsung has worked hard to optimize its OS, which is now pleasant to use, although at first glance it could confuse inexperienced users. The device has all the possible functions imaginable and almost all of them are configurable or can be deactivated. It's true, not everyone will use the million functions present, but as a fan of being able to make personal choices, I was pleased to be able to configure the smartphone the way I wanted to. Unfortunately, there are still duplicate apps that are redundant. Even if these aren't uninstallable, you can at least deactivate them. It's too bad Samsung doesn't let you just uninstall apps. In the new Galaxy Note 9, users can again rely on the performance of Samsung’s own Exynos 9810 , at least in the international variant of the design. In North America, Samsung relies on the Qualcomm 845 SoC, as it did with the Galaxy S9 and S9+. The working memory configuration is 6 or 8 GB. If you’re storing data on the Note 9, the device will have 128 GB or 512 GB, which can even be expanded to 1 terabyte with microSD cards. Unfortunately, we haven't gotten to test the North American version of the device, which should have impeccable graphics. The international Note 9 has proven be a true flagship and never suffered from issues with dropping apps. It could also multitask very well in demanding situations. Under extreme conditions, the Note 9's performance maintains consistent thanks to its new and improved heat sink. The Samsung optimization on the software also definitely played a role in this. For more details, I'll refer you to our specific performance test where I compared the Note 9's performance to the competition. There's good news about the audio . Samsung also implants audio features from the Galaxy S9+: stereo speakers that can output Dolby Atmos sound. The Note 9 speakers will satisfy everyone, ranging from hardened gamers to Netflix and YouTube fans. The volume is high and the quality is good, although the stereo isn't perfect due to the less powerful ear capsule on the main speaker, but this also applies to other flagships with pseudo/stereo speakers. The ear capsule is mainly used for mid-high frequencies while the speaker places more emphasis on the mid-bass frequency range. There's also a headphone connection available and AKG headphones come with the device. Lovers of of high quality audio will once again find an advanced equalizer with specific effects and the option of changing the audio to their liking: a feature similar to the one introduced on the HTC U11. The device comes with the codecs AptX, AptX HD and LDAC as well as the ability to control two Bluetooth devices simultaneously thanks to the advanced audio management from Samsung SmartThings. Samsung didn't give us any surprises with the camera and instead opted for the same configuration as the Galaxy S9+. 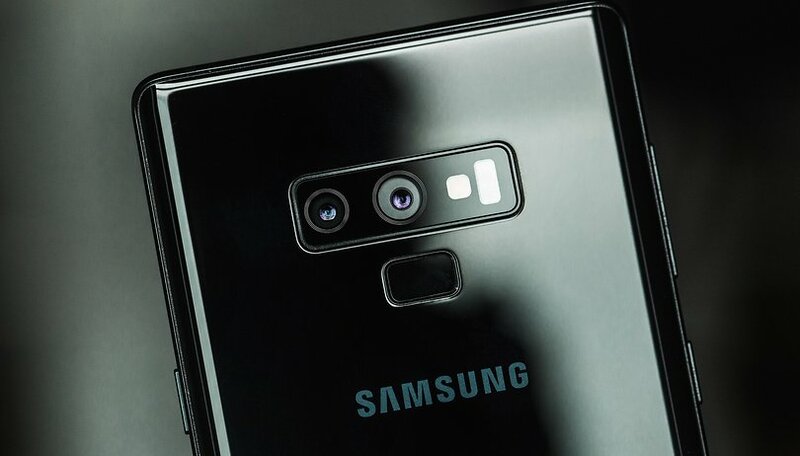 The Note 9 incorporates a dual 12MP camera with variable aperture between f/2.4 and f/1.5. This isn't a bad choice considering the photographic skills on the S9+. The biggest improvement Samsung has made in its (probably) last Galaxy Note concerns the battery. After the Note 7 battery debacle, the electronics company just tried to be as safe as possible with the next Note. The Galaxy Note 8’s battery capacity was just 3,300 mAh. The Note 9 now has an energy cell with a full 4,000 mAh , which according to Samsung, should last an entire day of intensive use. The ability to change the screen resolution is useful to better manage consumption. The Note 9 offers FullHD+ resolution, but you can take it up to 2960x1440 pixels. Personally, I think it's a waste not to make the most of the fabulous display and the difference in battery life isn't so extreme. I have to admit that my personal experience with the Note 9 has been confusing with respect to the battery life. I've managed several times to get more than one day of battery life (I never made it through two days though) with more than 8 hours of screen time. The Note 9 battery is a considerable upgrade compared to the Note 8 or S9+, but you still can't get through a whole weekend without seeking out an outlet. Luckily, the device is once again equipped with a Quick Charge 3.0 charger. It charges quickly, but the charger is a bit bulky. We would have expected more from Samsung, since they're always been at the forefront of fast charging, either with or without cables. It might be obvious, but it's better to be certain: the Galaxy Note 9 supports wireless quick charging. In our battery test, the Note 9 placed near the top of our list with 10 hours and 25 minutes of battery life. In everyday life, it's perhaps not the smartphone that I would recommend to people who want a smartphone that can last more than a day. I managed to reach the end of the day with 15-20% of the charge remaining, but in many cases, I had to recharge my smartphone at dinner time. The Android flagships have always been special. Despite the fact that everyone tries to be the best, there are always some that excel in certain features that make us fans truly excited. The Note 9 has been accused of being a minor update and an iteration of the Note 9 that isn't worth spending a thousand dollars on. The matter of price is always subjective and just depends on what you want to spend. When I had to recommend a smartphone over the $1,000 threshold, I used to say the Note 9. At the moment it's impossible to find a smartphone that is as complete as Samsung's phablet for $700. Nothing comes close. The best screen in the world, with exemplary performance and enough internal memory for any users. It has lots of RAM, the top cameras in the industry, a huge battery, elegant design, premium materials, stereo speakers, a headphone jack, pulse reader, iris scan unlock, S-Pen, and a billion software features. There's also wide customization options, DeX via HDMI cable, should I go on? The Note 9 isn't the fastest smartphone. It doesn't have the best battery life in the world and the cameras can lag in some situations compared to the competition, but where will you find another device with all these high-level features? The S-Pen might not be a suitable accessory for everyone, but the Note 9 is the most complete package on the market, and if I were to decide to invest this much in a device, the Note 9 would be my first choice. Are you excited for the release of the Galaxy Note 9? Let us know in the comments! From all the reviews & videos Samsung has out did itself with this offering. There is no other phone that offers what the note has, plain & simple. My favorite feature is the display, nothing comes even close to matching it. The same goes for the hardware. The bottom line for me, if I'm going to spend a g-whizz this is the phone I will spend it on. The note9 includes all the toys! yes so true and thts why in waiting for my new baby to come love the N8 but N9 is wht I want! Too much glass and curved dispaly for dreams. Get rid of that silliness and it becomes more attractive. But it wouldn't be "stylish" or "worthy of such a stupid price LOL. Sounds really awesum and im sure it would be great to have. I however am still loving and appreciative of my Note 4 as when I first got it (after Note 1 and 2) that I wont be updating any time soon. Now we wait for the Note 8 sales!!! Awesome device. It's been on sale at least on T Mobile for $720. Yes, it's pricey but it has all the toys. The iphoneX is the same price but the note definitely has all the premium features. So if I'm going to spend a g-whizz the note for me is much preferred!